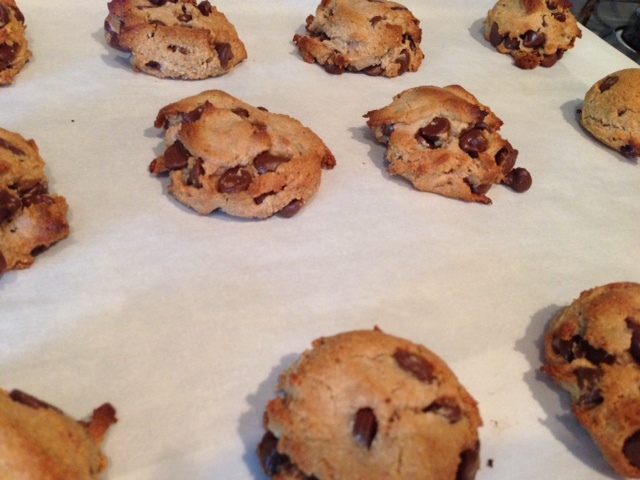 So I found a “guilt free” recipe to get my chocolate chip cookie fix. They are eggless, sugarless and flour less! Don’t worry, they taste really, really good. In fact I made a batch last night and they were gone with in minutes! I find the ingredients at Sprout’s, WholeFoods, or the Commissary! Just mix, scoop onto a parchment paper lines cookie sheet and bake at 350 degrees for about 10 minutes. Then cool for about 5-10 minutes. This recipe makes 9-12 cookies. So they don’t last long!